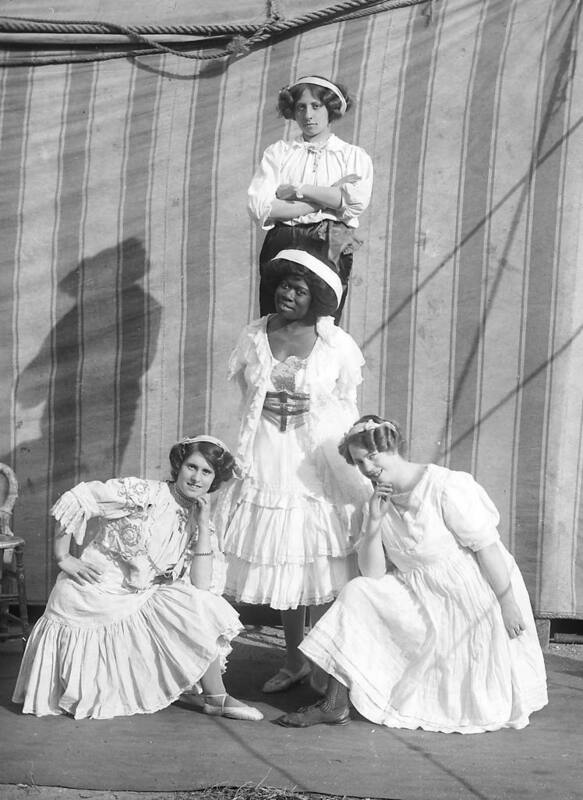 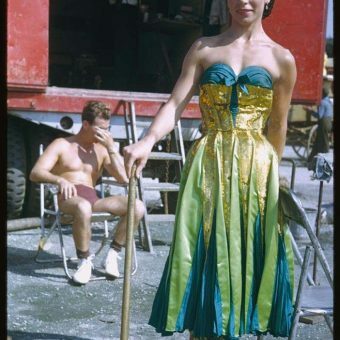 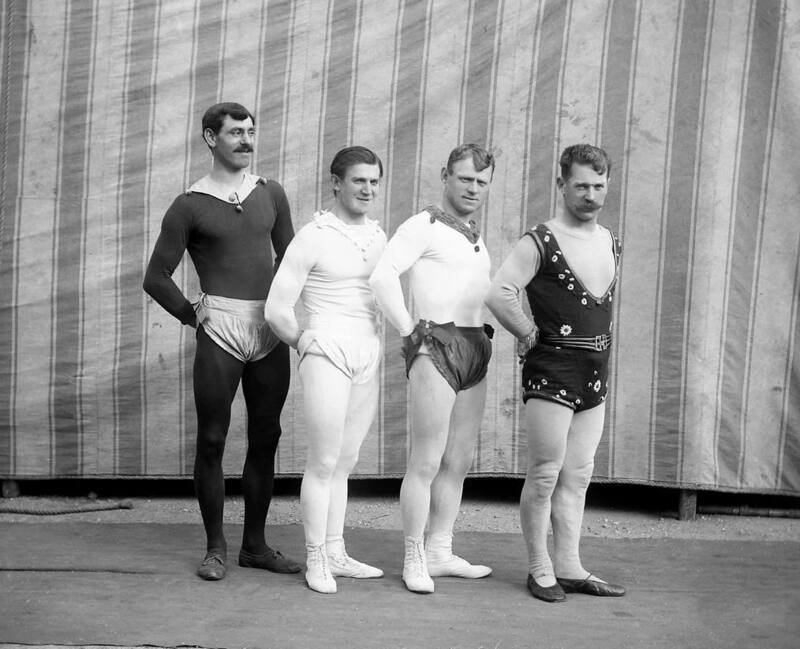 The three main circus shows photographed by Herbert Cooper were Duffy’s Circus, Buff Bill’s American Circus and Hanneford’s Canadian Circus. 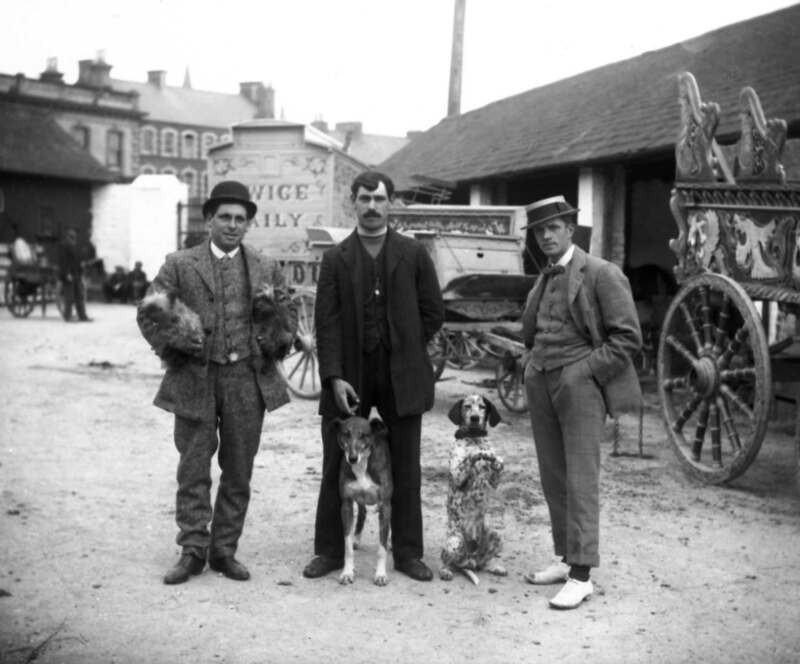 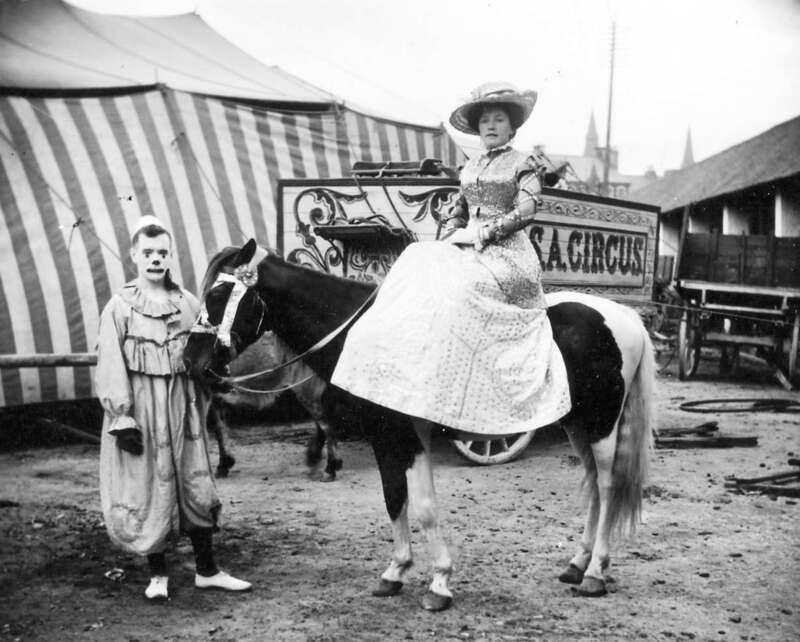 A few circuses toured Ireland in the years before 1914 and it was the heyday for these travelling shows. 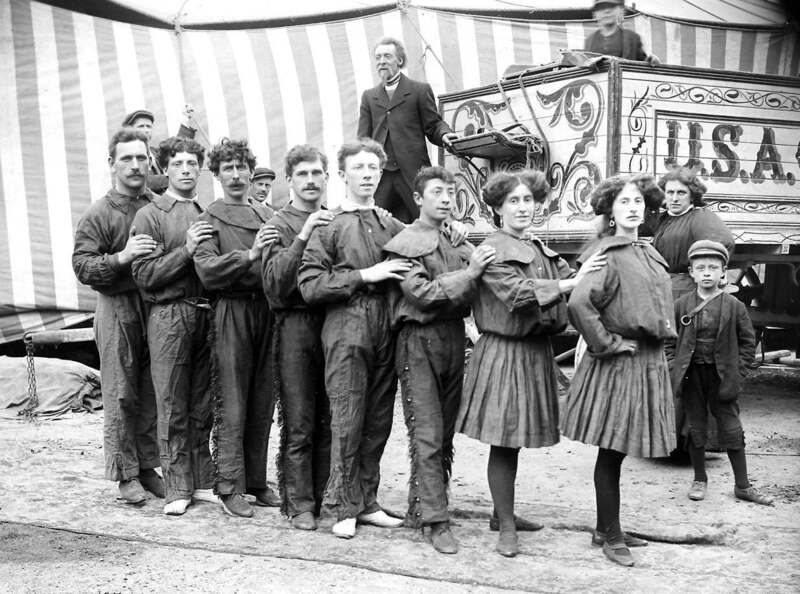 Big Tops were then lit by flares and it wasn’t until well into the 1920s that electric lighting became common, so most of the pictures were taken outdoors and during the daylight hours.The photographs of Duffy’s Circus were, almost certainly, all taken during the visit to Strabane, County Tyrone in 1911. 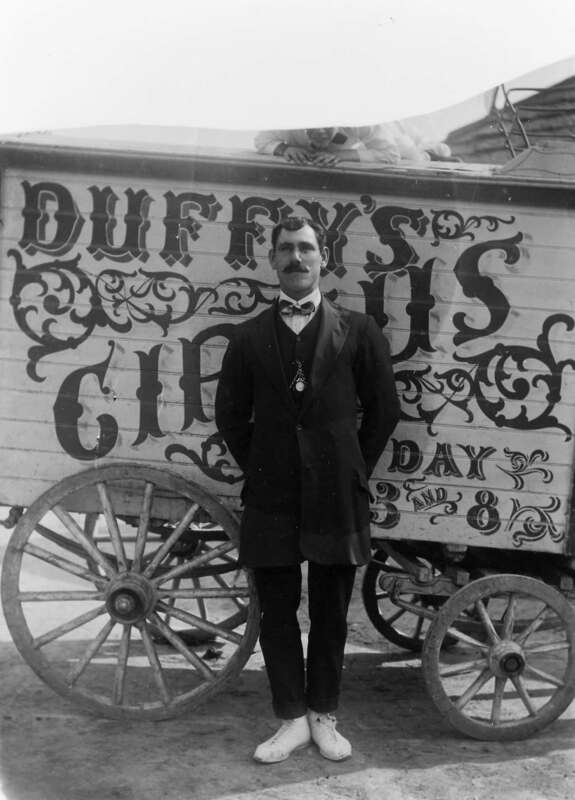 Duffy’s Circus was begun in the 1890s by John Duffy who died in 1909. 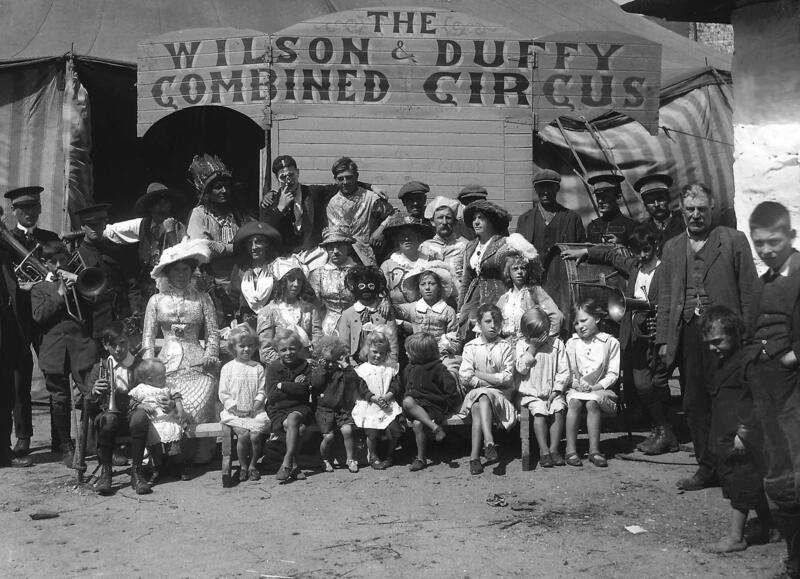 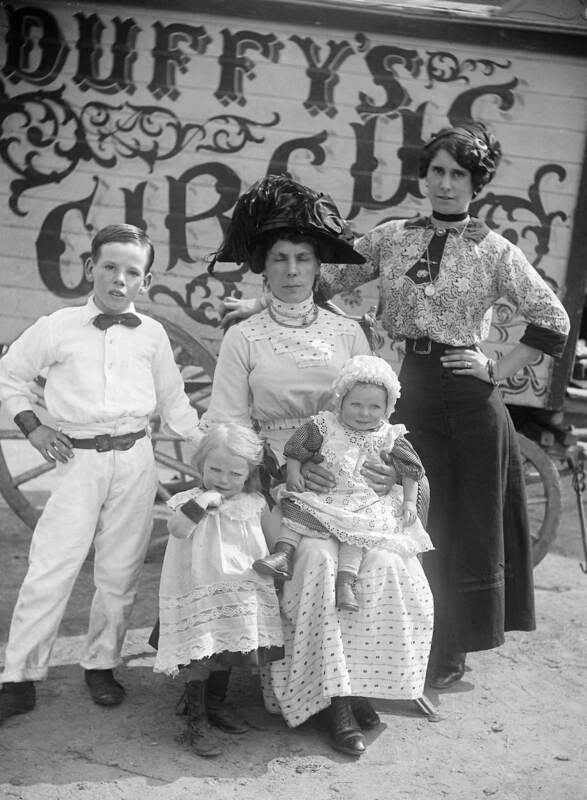 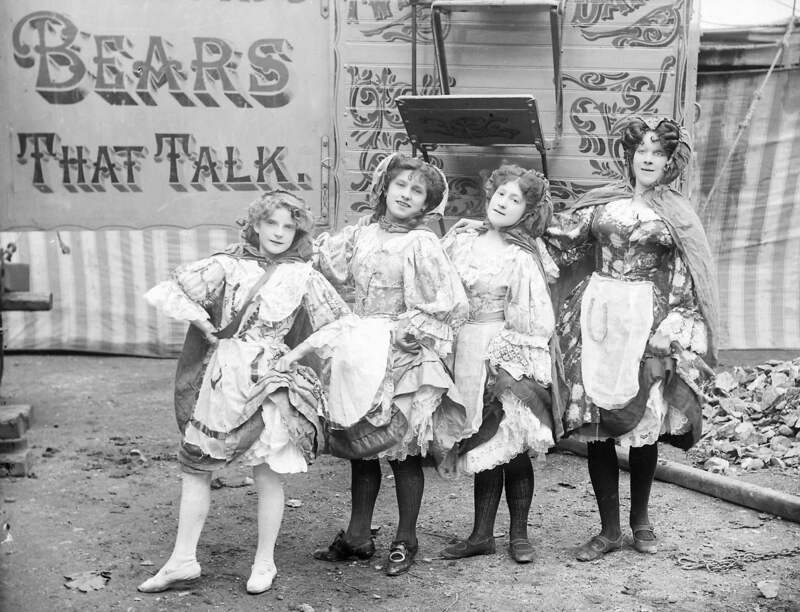 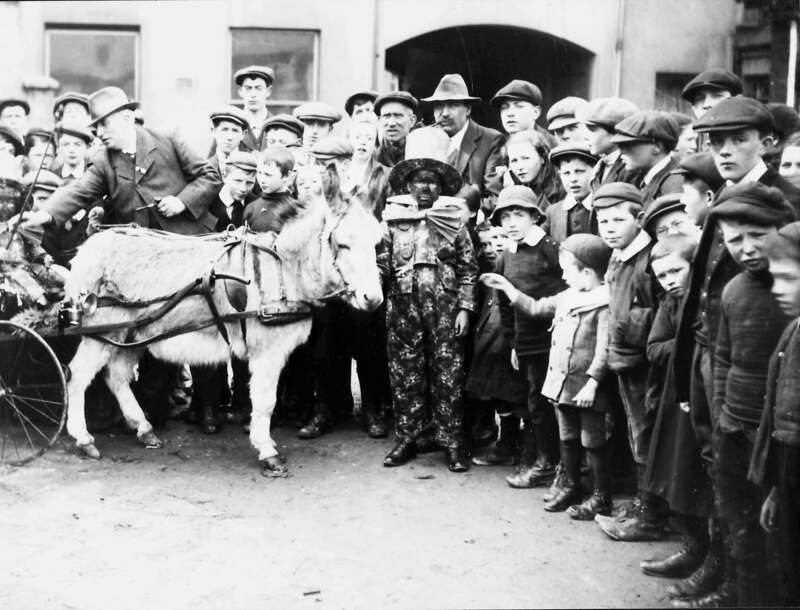 When Duffy’s Circus came to Strabane in 1911, it was already being run by John’s widow, Annie. 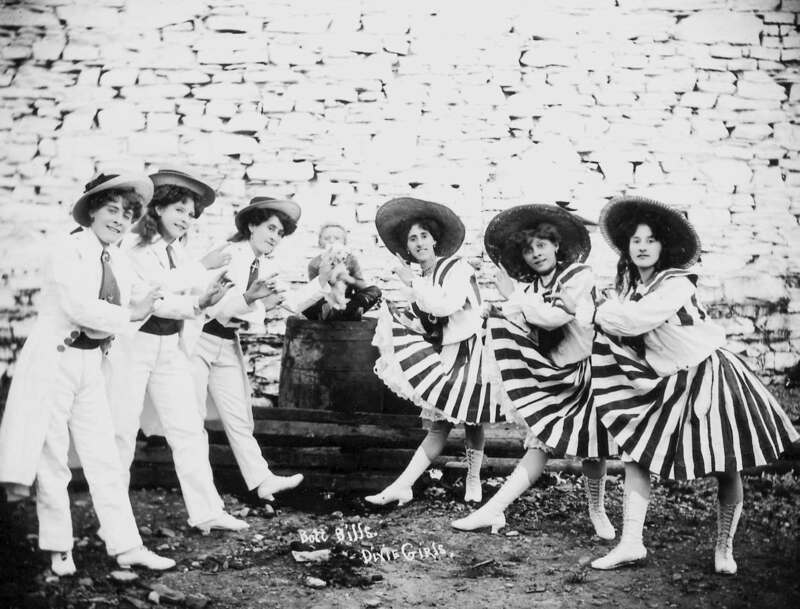 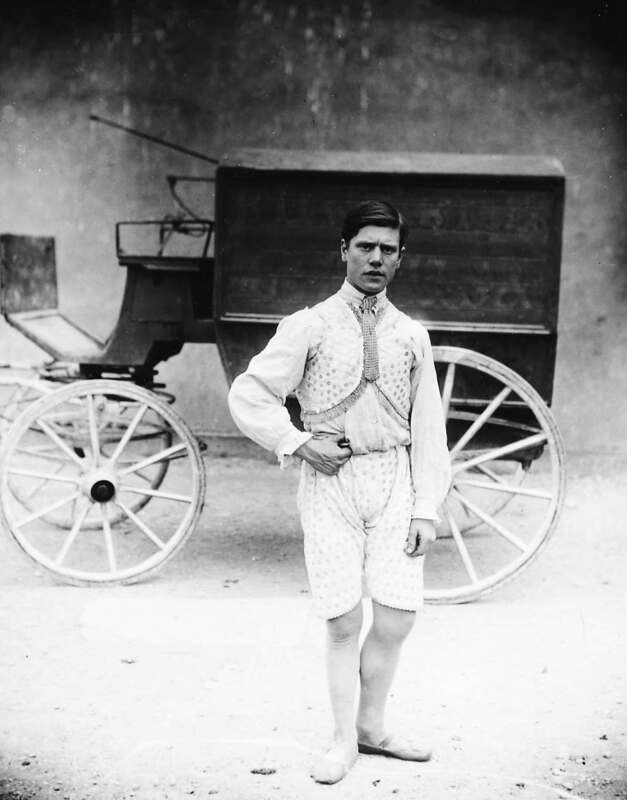 One of John Duffy’s sons, James, married Lena Kayes, daughter of William Kayes who ran the famous Buff Bill’s American Circus in Ireland before and after the First World War, Kayes himself being ‘Buff Bill’. 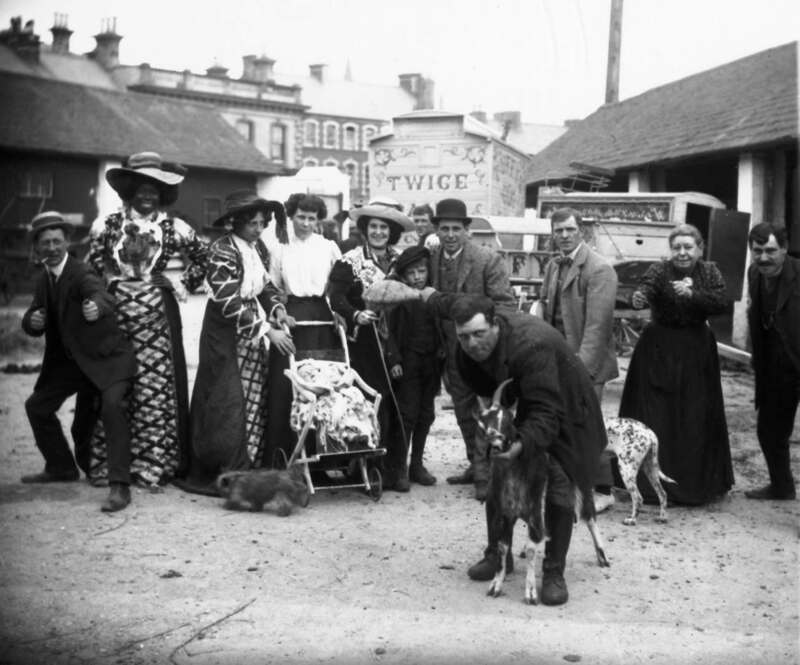 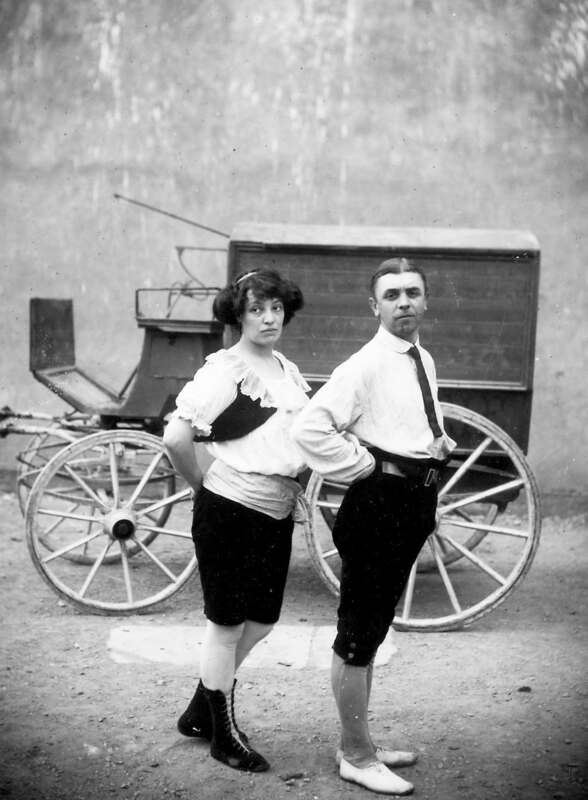 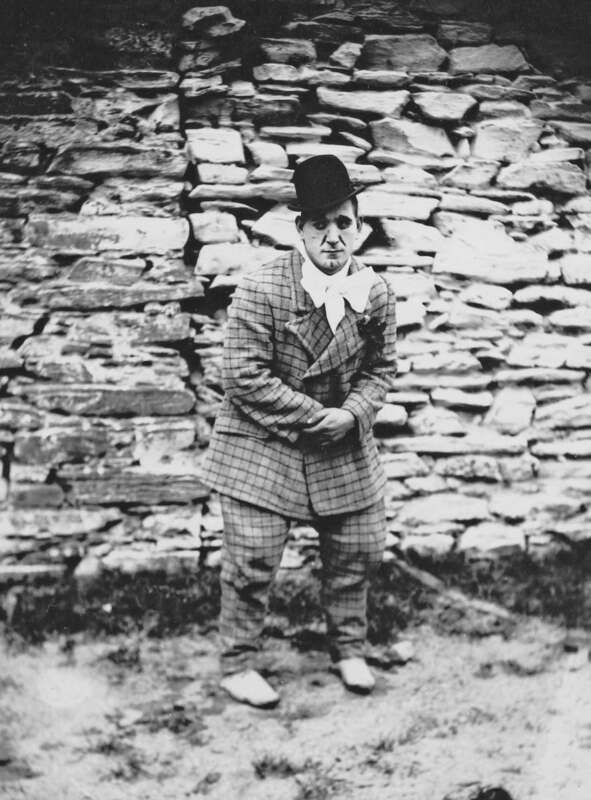 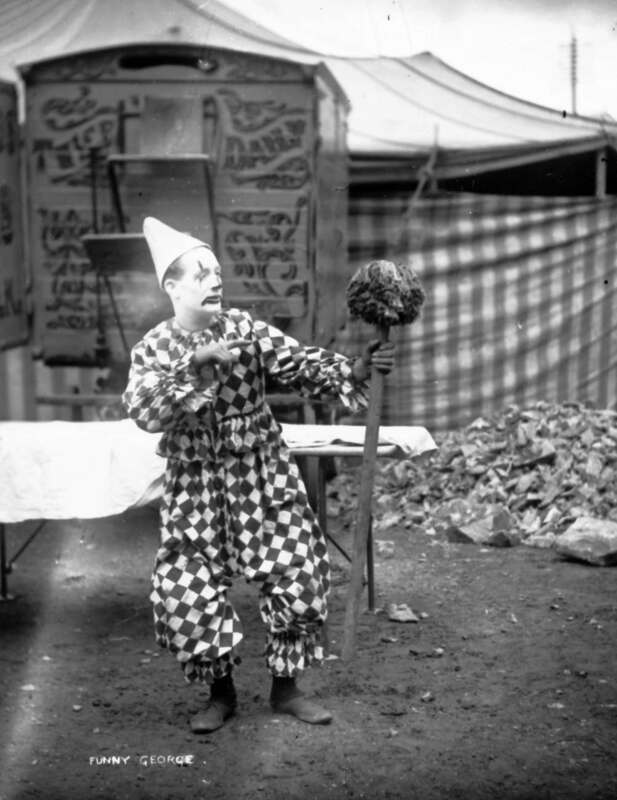 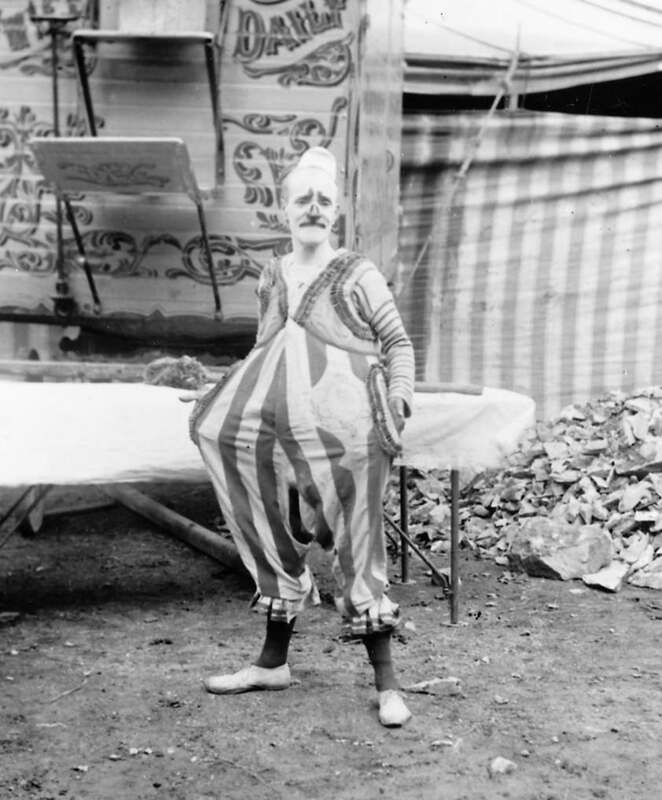 Ned Hanneford’s Canadian Circus toured Ireland up to 1916. 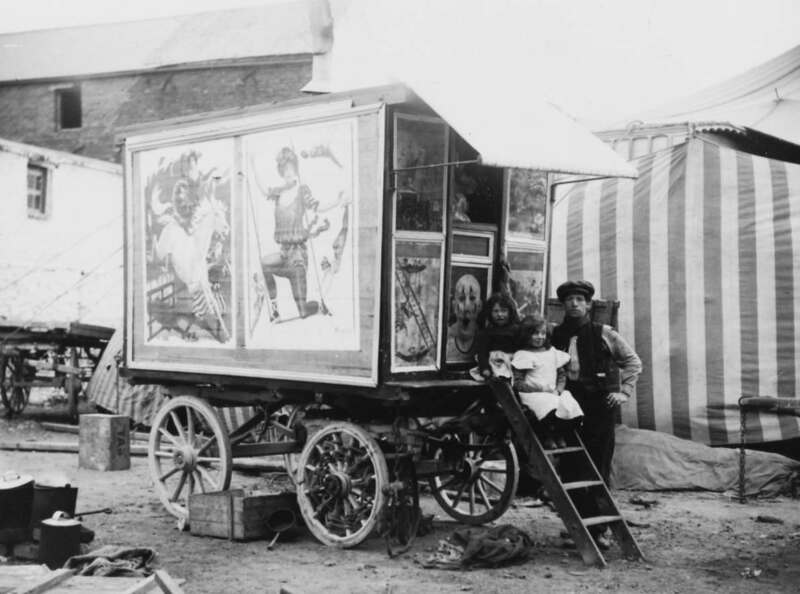 It was renowned for its menagerie, including lions and ‘bears that talk’. 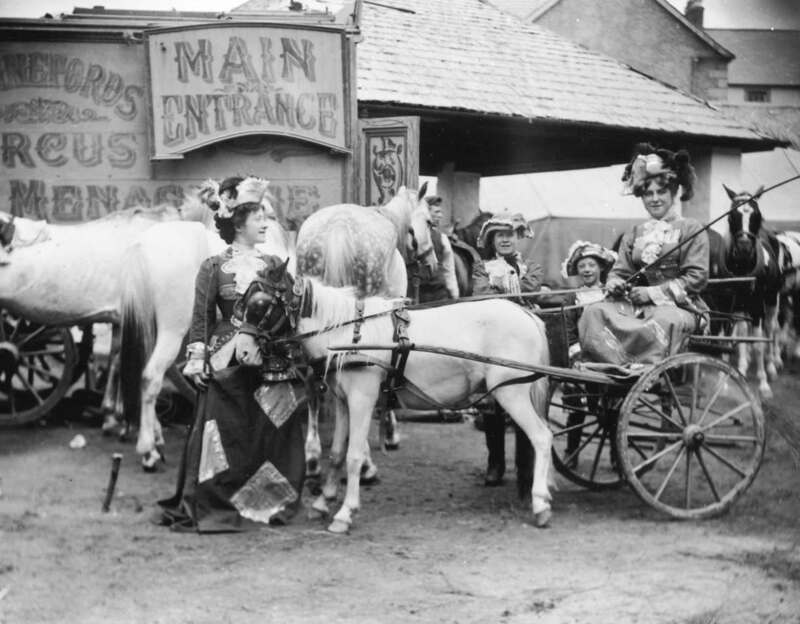 It also featured a splendid street parade headed by an ornate, gilded bandwagon drawn by 8 sleek horses. 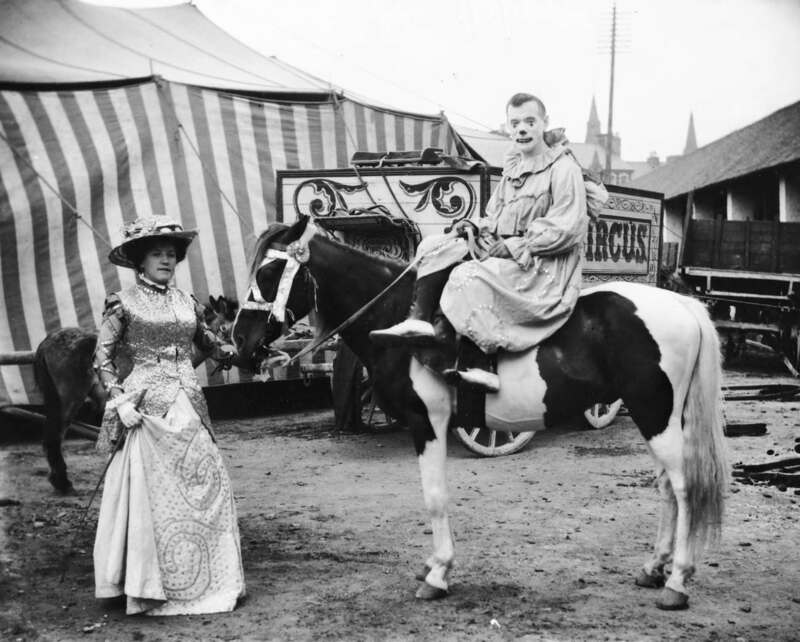 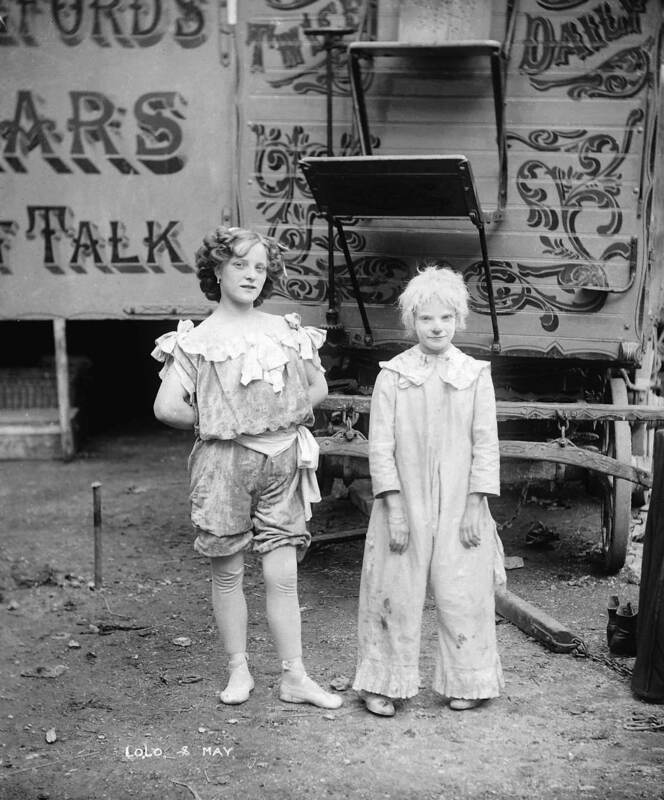 Cooper’s photos of Hanneford’s Circus must have been taken before 1914, a period which seems to have been the heyday of circus visits to Strabane. 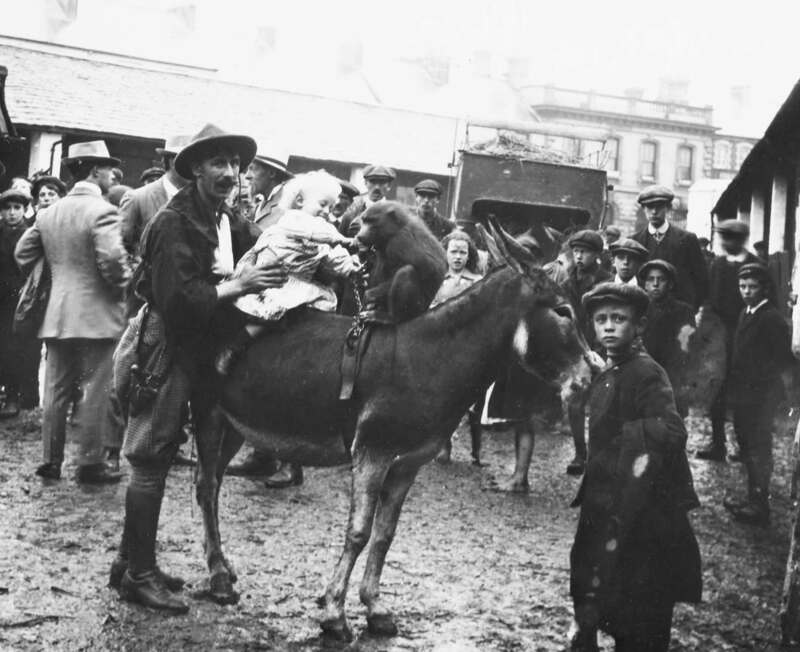 Herbert Cooper was born in Hammersmith, London, in 1874 and arrived in Strabane, County Tyrone in Ireland just before the outbreak of the First World War. 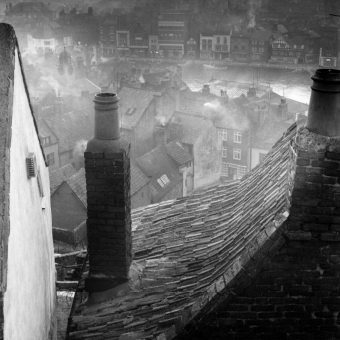 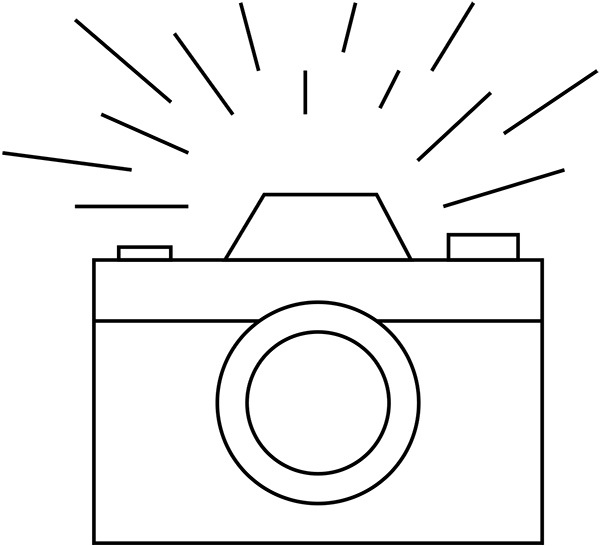 He took over the photographic studio in Railway Street which had been run by J. Burroughs from about 1901 until 1913. 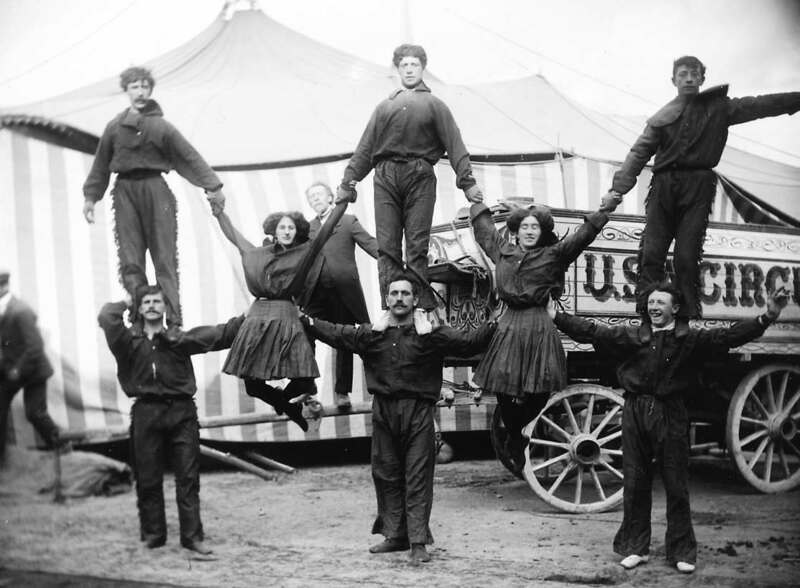 Buff Bill’s Circus, group of circus performers standing on each other’s shoulders, photographer H.F. Cooper, Strabane c.1910. 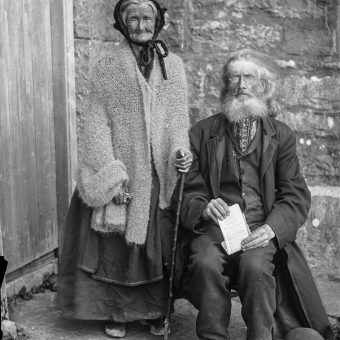 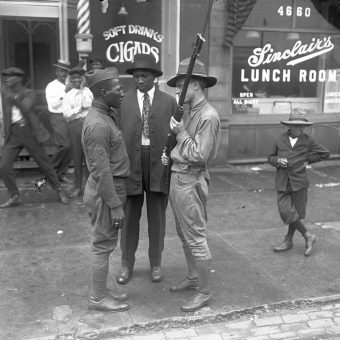 These amazing pictures are from the Cooper Collection at the Public Record Office of Northern Ireland.